I love the synergy. Michael Clayton made this lovely #Sketchnote of my WordCamp San Antonio #WCSATX talk! If you missed it, I believe the videos will be posted soon, but in the meantime, this is a distillation. Sort of humbling that it took me 45 minutes to say! If you're looking to integrate usability in your digital design process, here's an article from 2011 that is well worth reading. I enjoy analyzing user behavior, coming up with marketing strategies, and other creative endeavors. I enjoy it more than my clients enjoy it — but sometimes I fall into the trap of showing clients too much of these activities, instead of doing them (my core competency and passion) and pulling out the important takeaways in a quick summary for the client. Or better yet — just expressing the learnings in the final product. Jeff Gothelf's Getting Out of the Deliverables Business article on Smashing Magazine makes this case, and in the process, describes "Lean UX" — an analog to Lean/Agile development technology. Check it out. There's no substitute for prototypes and documentation when using distributed teams, overseas contractors, and so forth. But the client doesn't always need to see them. Clients used to a traditional design agency relationship are used to a waterfall approach, but can become fans if you involve them in fun, collaborative sessions. It's even more vital to have a budget for emerging ideas and different scope. User testing is so valuable. When clients can't afford it, do as much of it as you can, guerrilla style. Which deliverables do you share with clients, and why? User Experience Design - Not Firecats, but Unicorns? Jared Spool shared his thoughts on the UX/User Centered Design discipline, in this Slideshare, "It's a Great Time to be an Experience Designer. If you're not fond of Apple Computer analogies, you may need to skip past the loving paean to that company (especially if you don't enjoy the Genius Bar experience). Jared makes the point that, unlike Orthopedic Surgeons, for example - while we UX designers can specialize in certain disciplines, it's career limiting to specialize too much - what he describes as a compartmentalist. This reminds me strongly of why we at Firecat Studio are SO keen to sponsor and attend coworking sessions. We require the breezes and cross-pollination robustness that new people and their new ideas, methods and perspectives bring. It's why we love TED and sponsor TEDxSanAntonio. It's why we think Geekdom is so cool. And it's one reason why we prefer clients who want to collaborate with us in our work. Our ideal UX Designer has general skills, compared to many of the folks working in UX jobs today. She has a good sense of the visual, understanding sophisticated use of layout, typography, and color. She can organize content and navigation, increasing the design’s findability. She knows how to craft persuasive microcopy and create publication tools for the organization’s content providers. She knows how to craft design flows and envision the microinteractions that deliver great experiences. An interesting balance of left and right brained thinking - cross-hemispheric brain wiring. A visceral craving for novelty and the challenges of problem solving. Encouragement to continue to challenge and question. Ability to see problems from multiple perspectives. I'm very proud to say we have several "unicorns" already on the Firecat core team. But I'm in full support of there being more educational opportunities to create more of us. Read more about all this on the Unicorn Institute blog. I spoke on February 19, 2014 to the Association of Information Technology Professionals (AITP) San Antonio. We had a lovely interactive discussion about Mobile First Web Design. I provided information about Responsive Web Design (RWD), when it's a good idea to have a separate dedicated mobile website, or a mobile app. The AITP members in attendance added their own insights and experience to the discussion, from both the IT professional standpoint and as users of mobile technology and experience. Thanks, AITP, for making me so welcome, and for the meaty, productive discussion. I appreciate your invitation! While discussing mobile-friendly, responsive sites, we also discussed the Parallax web design technique - using animation, HTML5 + CSS layering to create a rich, single, scrolling page. Here's the website where we found several interesting parallax web site design examples. - but don't forget that parallax isn't right for every site - it can be slow to load, distracting, and less than ideal for content optimization and SEO. Here's the slideshare we looked at, especially for mobile statistics and trends. Thanks to Luke Wroblewski for his work on this topic. Navigation Design: "Make Everything Two Clicks Away"
At Firecat Studio, we do a lot of Website Redesigns. When a client approaches us for a redesign, they often say, "Our site looks outdated." And when we look at it together, they're right - we see a site using outmoded styles, maybe a Flash element, a width or orientation to the screen that says "Nobody considered mobile design when this was last touched." This is using our OLD logo. We want a NEW logo. I hate these colors. We need fresher colors. I'd like to see some different choices of fonts. We want a slideshow like our competitors have. I want it to MOVE! These are perfectly reasonable requests, but frankly, they leave me a bit cold. I don't get nearly as excited about a site's skin and makeup as I do about it's general health and bone structure. How should we categorize the information? What should our "navigation tabs" be so that people can find their way? Music to my ears! I get all geeked out and excited about the organization of information. About optimizing navigation and labeling to get people where they want to go. It's pretty common, actually, for clients to ask us to put "everything no more than a click away." That isn't easy, and it isn't always the best solution. I understand why they ask for it though. Putting content into a straightforward, clearly labeled navigation scheme seems really easy until you try it, and then watch someone ELSE use your scheme. Some of my most valuable experience has been spending time behind one-way glass in a usability lab, watching people struggle with an information architecture or navigation I was SURE was a winner. What makes sense to me doesn't necessarily make sense to a user. It's hard for anyone too familiar with a content set to create great navigation. As a vendor who's relatively new to a client's content, I'm positioned well to represent users - at the beginning of a client relationships. After working with a client over several years, I start thinking of the content like the insiders do, and lose that "fresh set of eyes" magic. Imagine a user thinking "Yep!" "Right." "LaserJet, there is is." "Bingo!" Bop, bop, bop. 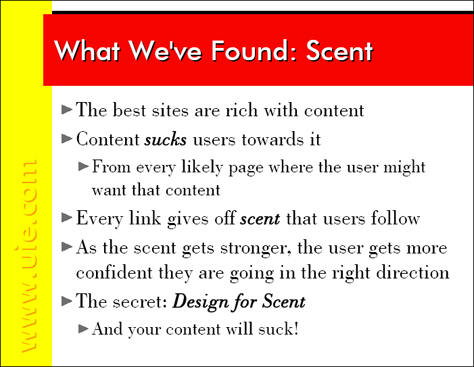 In this example, there's a couple things at work that make the scent straightforward. The user and the company have a shared vocabulary. Every item in this complex hierarchy can be put into a mutually exclusive category - categories don't have to overlap, they're not messy. But not all content sets are that straightforward. Like most design questions, there's no single right answer, and going too far to either extreme will backfire. Flat hierarchies tend to work well if you have distinct, recognizable categories, because people don't have to click through as many levels. When users know what they want, simply get out of the way and let them find it. But there are exceptions to every rule. In some situations, there are simply too many categories to show them all at one level. In other cases, showing specific topics too soon will just confuse your audience, and users will understand your offerings much better if you include some intermediate category pages to establish context. We offer a handy Website Redesign Checklist to help explore some of these deeper issues, and we'd be happy to send you a copy. People don't read most of what you post on the web. It's more true now than it ever was. But they love looking at pictures. Here are some of Firecat Sue's favorite infographics compiled into a Pinterest board. You'll notice many of the infographics are about web design, web strategy, and even infographics. That's because those are keywords we follow online, and these infographics describe tactics helpful to digital marketers. Morningside Ministries wins Website of the Year award! We love being able to say "we design award-winning websites." Here's another instance where one of the sites we helped our clients create won an award in their field for excellence in web design. Morningside Ministries won the Website of the Year award from the Leading Age organization. Congratulations to the talented folks at Morningside Ministries, our genius visual designer Jessie Sebastian, our developer Julia Terno, and website technical producer Chris McDermott. Way to go, team! I gave this presentation this week to Acción Texas about optimizing a business web presence. Smart group of women business owners with a bunch of specific questions, and some great ideas to share. Here's the presentation. In September, Bob Hotard and Adam Thielman gave Firecat coworkers a great overview of Responsive Web Design - the art and science of designing and creating a website that optimizes the available width of the browser window, whether that's a big desktop monitor, a laptop, a tablet, or a mobile phone. Demand has been high for them to share their presentation - and here it is! Thanks again, Bob and Adam, for sharing your very enlightening presentation. Let us know how your responsive design works out - and everyone, please continue to share links and information on the topic.